Maggie Wilson of Shelter Co. takes us inside her chic California rental—and her temporary outdoor tent. Maggie Wilson doesn’t like to put limitations on herself—or her home. 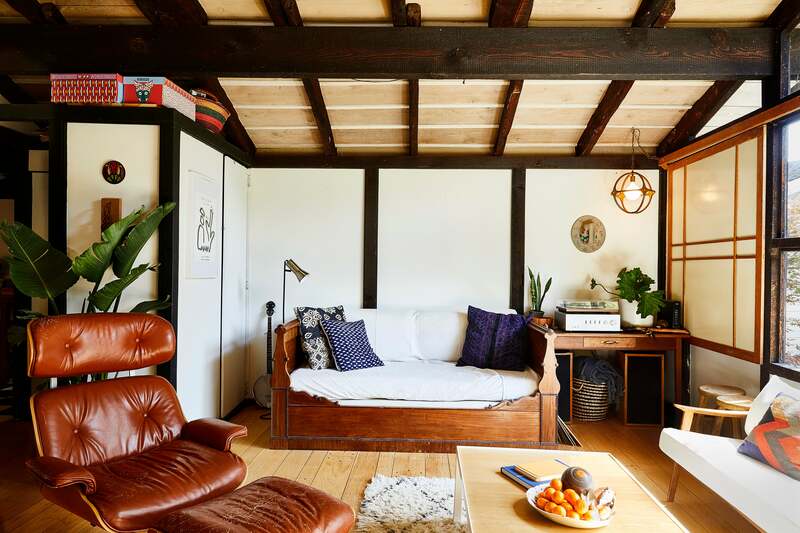 Instead, the creative director at Shelter Co., an event planning and production company known for their luxury tents, views her tiny California cottage as an open invitation. “We tend to host less formal parties, and more, let’s call it, ‘office hours,’” suggests the San Francisco native. On any given day, Wilson and her husband, Tim, who runs advocacy campaigns for Consumer Reports Magazine (“I always joke that he saves the world and I throw parties”) will host a revolving door of friends and acquaintances at their cozy and quiet rental in Kensington, CA. Like most former city dwellers, after years of dealing with noisy streets and small apartments, the couple was ready for a change of scenery—specifically one with less pavement and more wildlife. While the pair was initially set on the idea of moving to the countryside, Wilson and her husband decided to give the Bay Area one last chance when she stumbled upon a nearby listing with their dream outdoor space. “I saw this weird little inlaw cottage in the area of the east bay that I had never even heard of and I was like, ‘I have to go today and meet the owners,’” recalls Wilson. Situated just north of Berkeley above the hills of El Cerrito, the sweet dwelling was even more magical in person. Along with their cottage, the acre plot also encompasses a three-bedroom house (home to their landlords), as well as another one bedroom apartment. “They raise chickens, bees, and have a ton of elevated garden beds. The landlady has converted her garage into a painting studio where she teaches classes. But we like to say that it’s a compound, not a commune,” laughs Wilson. Perhaps even more intriguing than their co-living lifestyle is the duo’s current sleeping situation. With the aim of reorganizing and adding storage to the cottage bedroom, Wilson and her husband spent the summer snuggled in a Shelter Co. tent. Surrounded by uninterrupted wilderness and breezy California bliss, her serene set up is as peaceful as you’d imagine. Read on for everything Wilson had to share with us about getting back to nature—and bringing your style with you. What led you to the decision to sleep out in the tent? I know that you also rely on an outdoor shower. What’s it like to function and sleep in the outdoors on a regular basis? Let’s get back to this “compound” living situation. What’s it like sharing this land with so many other people? How were you able to decide what to get rid of during your initial purge? What are some of your favorite pieces that you’ve collected over time? Your kitchen is adorable. Is it easy to function in? Entertaining is clearly a big part of who you are. What’s it like for you to host get-togethers here?